The Tancho (Japanese Crane) is regarded as the most majestic and elegant birds in Japan with its slender figure, well-balanced contrast of black and white feathers on its body, and a crown-like red spot on its heads. 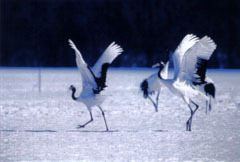 The sight of the cranes dancing on the boundless, snow-covered land is breath-taking. Kushiro Marsh where many of the tancho congregate was registered on the Ramsar Convention list by the Japanese government in 1980, immediately after the nation became a signatory of the Convention, which is officially called "Convention on Wetlands of International Importance Especially as Waterfowl Habitat." The marsh was designated as a National Park (Kushiro Shitsugen National Park) in 1987 to help protect the land and its inhabitants. From its beautiful appearance and a legend that cranes live to thousand years old, the Japanese people have long considered tancho as a symbol of longevity and auspiciousness. In 1890s, as Hokkaido was rapidly being developed, tancho were once thought to have become extinct. However, the discovery of about a dozen surviving tancho in Kushiro Marsh in 1924 caused a movement for their protection. In the winter of 1952, some cranes were found almost starving, unable to feed themselves because of a heavy snowstorm. The local people started feeding them with corn and buckwheat, and have continued to do so every winter thereafter. Their simple but steady protection activities have greatly contributed to saving the species from extinction, and, according to a recent survey, approximately 600 cranes now live in the Kushiro area. Photos: (Top) A pair of tancho dancing on the snow (Ministry of Foreign Affairs); (middle) Kushiro Marsh (Hokkaido Tourist Association).